It has been so warm and the weather has been beautiful here in the OC this weekend. But, next week's forecast goes back to.... you guessed it cold and even rainy so we are not done with winter yet friends. And yes, you can still pull out your favorite fur jacket like this amazing bomber and continue to wear it until spring officially begins. I love this fur bomber. What a great idea for a special jacket right? I love the leather detail too. I paired it with this cute basic white tee, some great skinnies and basic black booties. This is the perfect look for running around town in the daytime running my errands, or a fun dinner out with my hubby and my boys. I'm telling you, you need need a faux fur bomber. It is a must have to wear for the remainder of the winter season. I would love to hear your thoughts on this trend. Thanks to Kara Nixon for photos. You can shop this look by clicking on the links above. Happy Reading!!!!! One of my favorite bands of the 80's was Guns and Roses. Who didn't know every word to every song. Am I right? I love honoring some of my favorite bands with the perfect band tee. This one is an all time favorite. I wanted to make this look very rocker chic. I wanted to also channel my inner Stevie Nicks with this long velvet duster. Isn't it the coolest piece? I paired my band tee with this duster, added a perfect pair of skinnies and some booties, and I was ready to hang out with band. Well, not really but I love this fun edgy look. What do you think of the rocker chic trend? Who is your favorite rock band? I would love to hear about it. Thanks to Kara Nixon for photos. You can shop this look by clicking on the links above. Happy Reading!!!! I don't know about you, but I have been obsessed with leopard everything all season!!!! I love a great leopard top, pants, scarf and of course skirt like this one. Bias cut skirts are currently so on trend and this one is one of my favorites. 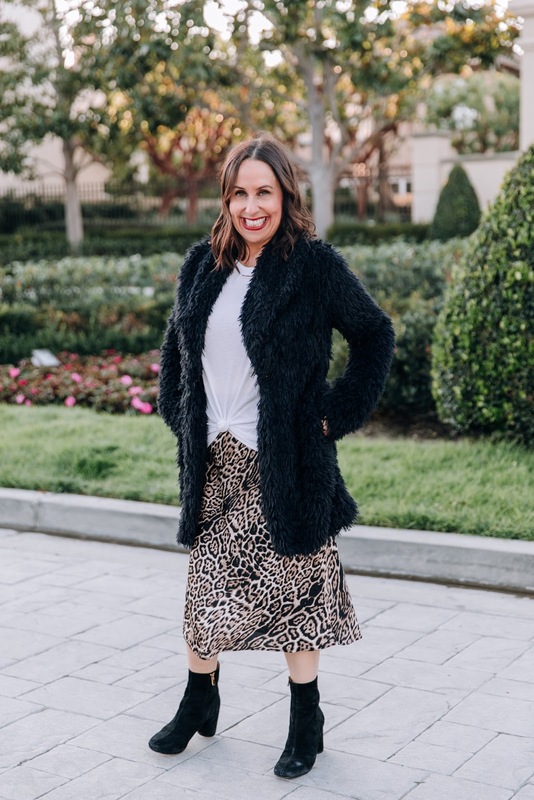 I paired this leopard print skirt with my go to shaggy fur coat that I have been wearing nonstop!! It has been perfect for all of the cold weather we have been having in the OC!!! I added a simple white tee and some easy black booties and my outfit was complete. What do you think about pairing textures and prints together. I love it!!! Thanks to Kara Nixon for photos. You can shop this look by clicking on the links above. Happy Reading!!!! Happy hump day!!! 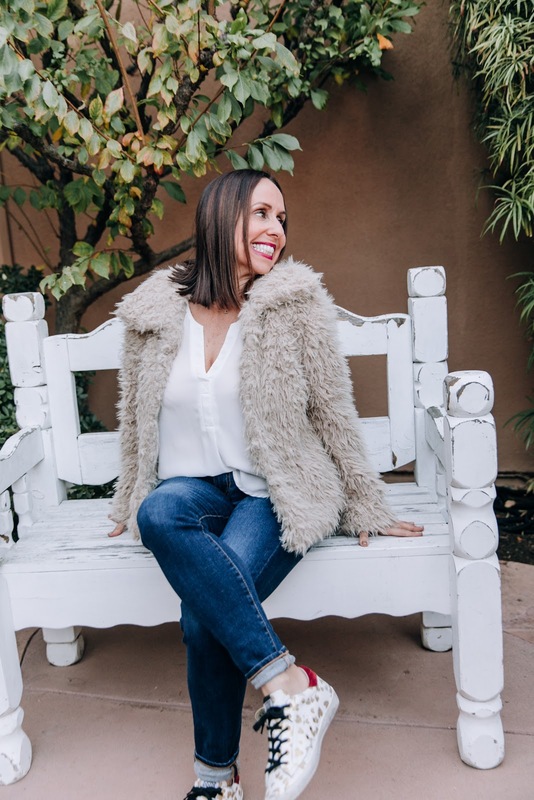 I have to introduce you to one of my favorite winter must haves-- the corduroy jacket!!! And this one is soooooo good. I love the color and it is so comfy cozy. I paired this cute corduroy jacket with some basic skinny jeans and these Jeffrey Campbell booties. I highly recommend investing in a neutral pair of booties. They literally go with everything. And I've been wearing this Madewell tank top non stop. It's the perfect basic addition to your wardrobe. I hope you all pick up a corduroy jacket to celebrate the rest of the winter season (and p.s. you can pull it off all through spring too). Thanks to Kara Nixon for photos. You can shop this look by clicking on the links above. Happy Reading!!!! 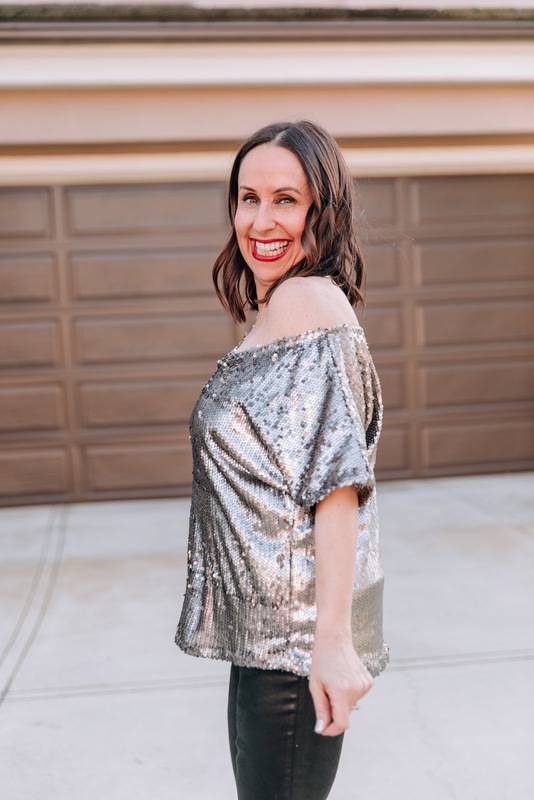 Do you love sequins as much as I do? I truly think a fashion girl can NEVER have enough sequin pieces in her wardrobe. And I am obsessed with coated jeans too!! I wear coated jeans with blazers, more structured blouses, sweaters and the list goes on an on. In this look I paired this adorable Vicidolls sequin silver top and my go to AG coated jeans. I added my favorite heels and my signature red lip and my look was complete. This is such a great look for date night with my hubby, or a fun girls night out. 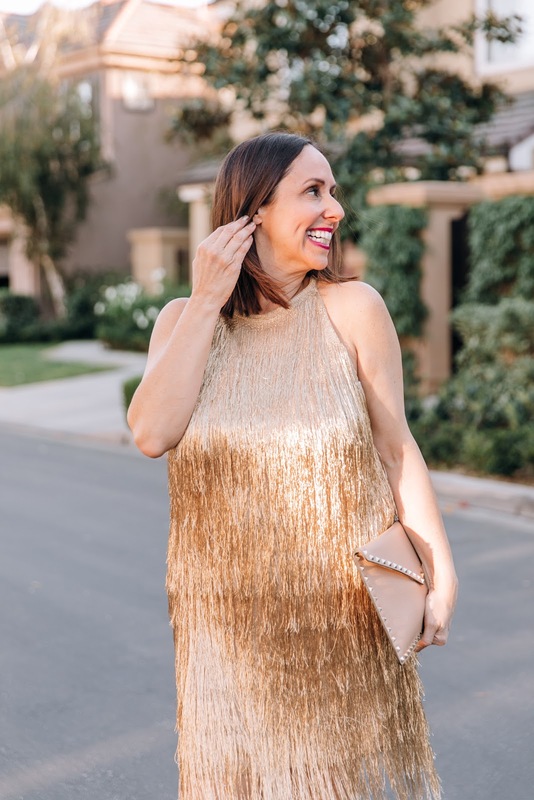 What do you think about adding sequins to your life? And coated jeans? I promise, you need them both!! Thanks to Kara Nixon for photos. You can shop this look by clicking on the links above. Happy Reading!!!! I love this winter weather and wanted to share some of my favorite looks from the season!!! I think this is one of my all time favorite sweaters. I love the color. You can read about it in this post. 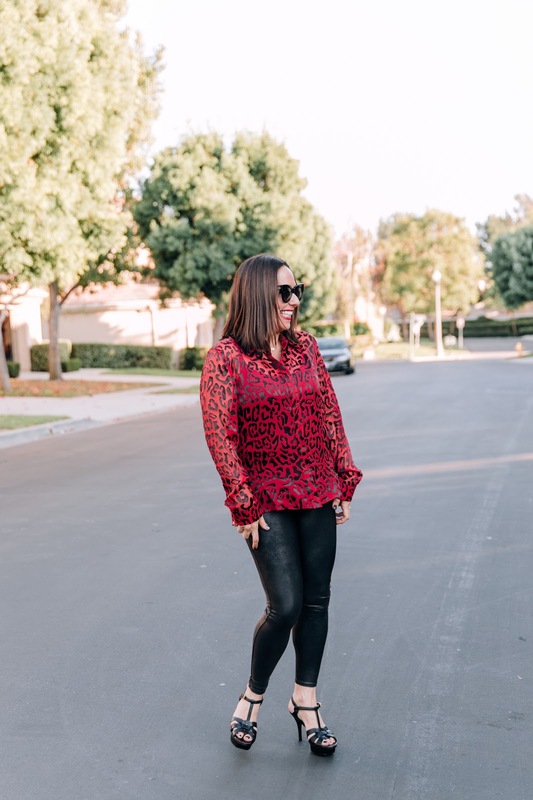 I wore this top nonstop during the holiday season, but you can wear it all year long!!! You can read about it in this post!!!! 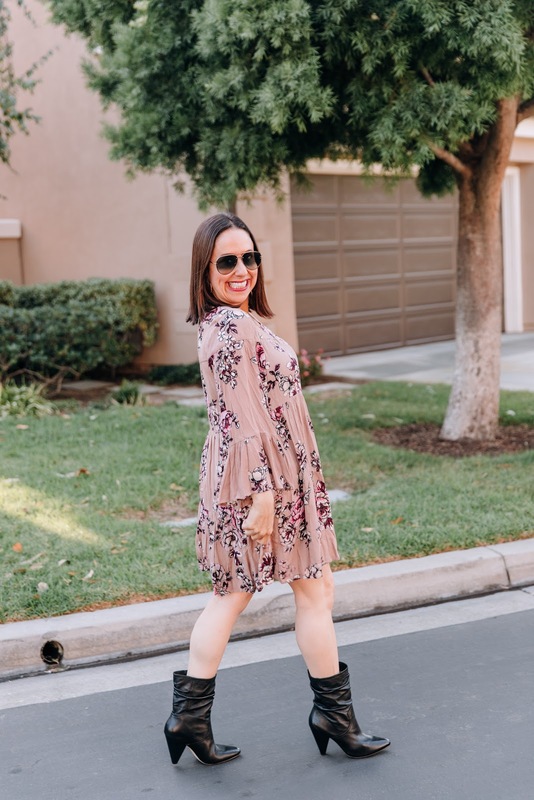 I love a great dress and these booties for winter. You can read about it more in this post. I love camo and dressing it up is always a good idea. You can read more about it in this post. This is my absolute favorite dress. You can read all about it in this post. 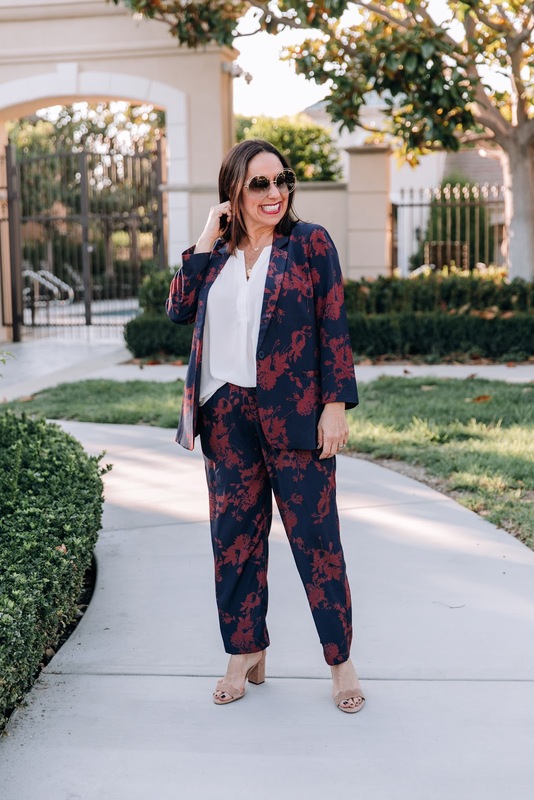 How cute is this pant suit? Love love it!!! You can read about it in this post. I cannot thank you enough for your support over the last year. I can't wait to share more with you all in 2019. You can shop these looks by clicking on the links above. Happy Reading!!! !